What Is The Three Poles Challenge And Who Was The First Person To Win It? Mountaineer Edmund Hillary inspired the creation of the Three Poles Challenge. 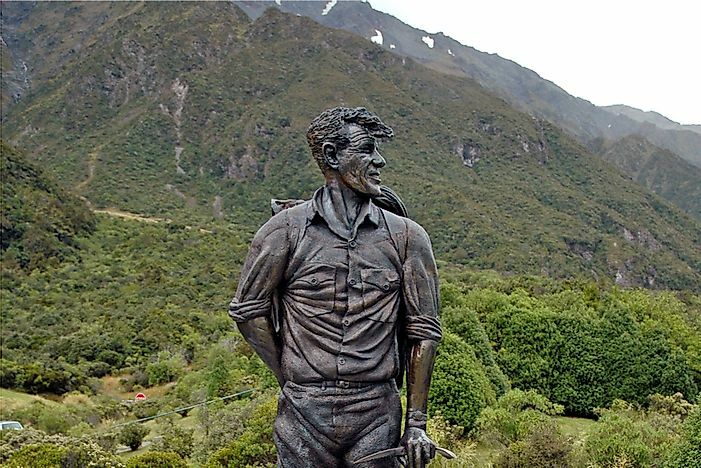 Commemorative statue of famed mountaineer Edmund Hillary. Edmund Percival Hillary was born on 20 July 1919 in Auckland, New Zealand. A school trip to Mount Ruapehu sparked his interest in climbing. He completed his first major climb in 1939 when he reached the summit of New Zealand's Mount Ollivier. He reached New Zealand's highest peak, Mount Cook or Aoraki, in 1948. In 1953, he reached the summit of Mount Everest, the highest point on Earth, with Nepalese Sherpa mountaineer Tenzing Norgay. Hillary and Tenzing thus became the first confirmed people to summit the mountain. In return, Hillary was appointed a Knight Commander of the Order of the British Empire. During the following years from the 1950s to 1960s, Hillary climbed another ten Himalayan peaks. As part of the New Zealand section of the Commonwealth Trans-Antarctic Expedition, he reached the South Pole in 1958. He reached the North Pole by plane in 1985, accompanying Neil Armstrong, and simultaneously became the first man to reach both the North Pole and the South Pole, as well as the summit of Everest. His accomplishment became known as the Three Poles Challenge, and inspired generations of explorers and mountaineers to follow in his footsteps. The Three Pole Challenge is an open challenge that seeks to determine who reaches the polar regions of the earth, and the summit of Mount Everest. Edmund Hillary became the first person to accomplish the three tasks when he trekked to the summit of Mount Everest in May 1953. In January of 1958 he reached the South Pole, and in 1985 he reached the North Pole alongside Neil Armstrong. However, the Guinness World Records recognizes Erling Kagge of Norway as the first person to complete the challenge on foot because Edmund flew to the North Pole. On May 8, 1990, Kagge trekked to the North Pole alongside companion Børge Ousland. On 7 January 1993 Kagge singlehandedly journeyed to the South Pole, and on 8 May 1994, he reached the summit of Mount Everest. Antoine de Choudens completed the challenge on 5 August 1997 and became the only person to accomplish the challenge without the support of oxygen as he ascended to the summit of Mount Everest. In 2002 Tina Sjögren went into the record books as the first woman to successfully attempt and complete the challenge. Adrian Hayes set the fastest record for the challenge. Hayes completed the three tasks between 25 May 2006 and 28 Dec 2007; a record 19 months and three days. He smashed the then record of 24 months. In 2016, Masha Gordon went into the books of records as the fastest woman to complete the challenge. In May 2016 Colin O'Brady set a new record after completing the challenge in 131 days. The North Pole lies directly on the opposite side of the South Pole. It is slightly warmer than the South Pole because it lies at the center of the ocean which reserves heat. Although warmer than the South Pole, the North Pole is far colder than the rest of the planet. On average, the temperature at the pole reaches −31 °C but during the winter the temperature drops to about -50°C. The South Pole is the only place on the planet that receives no light between March to September. Unlike the North Pole, the South Pole sits on a land mass. Since the land does not store heat, it is the coldest regions on the planet. The average temperature is −45.8°C. Mount Everest has an elevation of 29,029 ft and is the tallest mountain on the planet. For a longtime China and Nepal argued over the height of the mountain until 2005 when both states reached an agreement. The mountain was named after British Surveyor Sir George Everest. Edmund Hillary holds the official title for the first confirmed ascent of the mountain after he successfully did so on 29 May 1953. Mount Everest is among the hardest mountains to climb due to its height, terrain and low temperature. As of 2017, it was estimated that about 300 people had died on the mountain. What Was the War of the Three Kingdoms?